Today, one of the biggest concerns many people have is hair loss (alopecia). It is often thought of as a condition that only men experience, but over the last few decades things have changed and it has also become one of the major issues of women as well as teenagers, affecting everyone at any given age the same way. Even though the causes of hair loss and its treatments vary for each person, there are still hair loss types where people experience the same symptoms and the same sequences or patterns of progression. 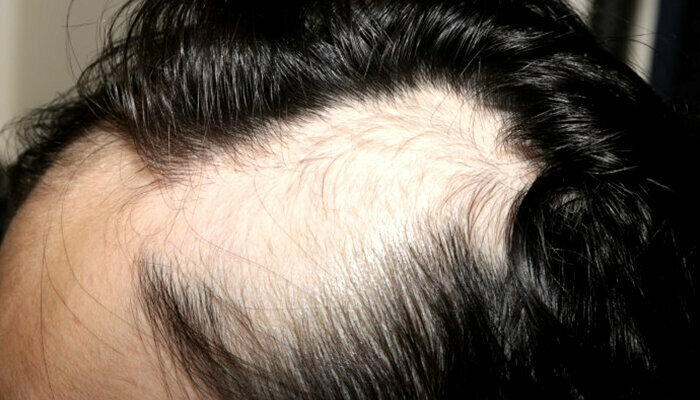 It is important to emphasize that the general term used for all types of hair loss is also defined as alopecia. ‘Androgenetic Alopecia’ also known as ‘male-pattern baldness, is the most common form of hair loss experienced by men as well as women. “This hair loss condition that is said to be triggered by male hormones (androgens), is most likely to occur in genetically predisposed individuals anytime after puberty. It is characterized by the progressive dispersal of hair loss that proceeds in a highly reproducible pattern, which is generally accompanied by a receding hairline, affecting the temples, top of the head and mid frontal scalp. Hair loss can also exhibit a pattern that begins from the top of the scalp and progresses downwards. Androgenetic Alopecia is generally caused by Dihydrotestosterone; a derivative of the male hormone testosterone that binds with receptor sites of androgen sensitive follicles and effects follicular miniaturization. 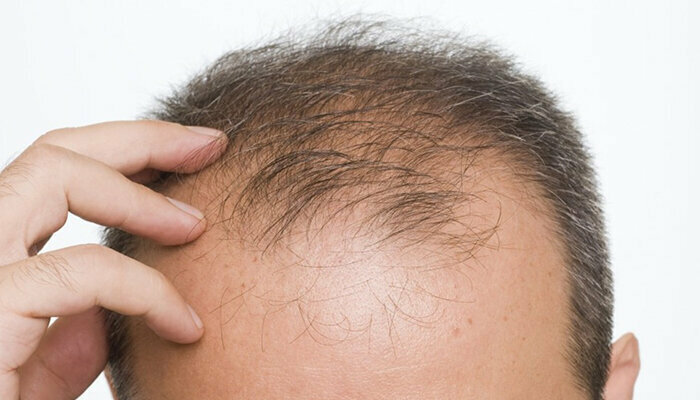 The growth cycle or anagen phase of certain follicles within the balding pattern that have been exposed to dihydrotestosterone for a length of time, will start to shorten, thus leading to weaker and shorter hairs. In the more advanced stages, hair follicles may become severely damaged and for this reason may not re-grow. It is a hair loss condition that is generally difficult to prevent and cure but the person still has the option of having a hair transplant as an effective and permanent solution. Alopecia Areata is a common hair loss condition that occurs worldwide about equally in men and women and is said to be an autoimmune reaction in which your immune system mistakenly attacks your hair follicles. This hair loss condition is also known as ‘patchy hair loss’. Even though autoimmunity is widely assumed to be the cause of Alopecia Areata, it can also be related to other causes such as; genetic predisposition, environmental factors, psychological and physical stress. Alopecia Areata is characterized by sudden hair loss causing the absence of hair that is usually seen in round patches, which may appear anywhere on the body such as eyebrows, beard area, but are most common on the head. The solution for such cases is eyebrow transplantation for women and beard transplantation for men. Unfortunately no specific treatment is known for Alopecia Areata. Hair often grows back but there is always a high possibility of relapsing. Alopecia Totalis is also an autoimmune condition just like Alopecia Areata in which the immune system mistakenly attacks the hair follicles, but unlike Alopecia Areata it causes complete baldness of the scalp. Characterized by the complete loss of hair on the scalp; the causes of Alopecia Totalis also remain uncertain but it is generally thought that stress could be a factor that triggers this type of hair loss other then the immune system. With the possibility that it may progress and lead to Alopecia Universalis, which refers to the complete hair loss on the scalp and all the body hair, Alopecia Totalis is one of the most feared hair loss type. There is no cure or permanent solution for Alopecia Totalis, but generally the usage of immunomodulatory agents is recommended. These are; herbs and greenery that contain selenium, vitamin A, B2, B6 and C.
Onion, garlic, tomato, carrot and broccoli are a few examples. This hair loss condition that occurs through time and is commonly seen in African American women, is mainly caused by the pulling force applied to the hair as a result of certain hair styles like braiding patterns or tight ponytails. Traction Alopecia, which is known to be a traumatic hair loss condition due to the chronic pulling, pressure and force applied to the hair; is characterized by a receding hairline generally around the temples and towards the vertex of the scalp, leaving patches of thin or broken hair in the areas that have been affected. This hair loss condition can be cured but the first requirement is to change the hair style and wear the hair loose, otherwise the hair follicles may be damaged and prevent the regrowth of hair. Cicatricial Alopecia, is a non-hereditary hair loss condition that affects both women and men of all ages, characterized by permanent hair loss that is accompanied with scarring. It is caused by a number of inflammatory disorders that destroy the hair follicles and replace them with scar tissue. 3 % of people who suffer hair loss are affected by Cicatricial Alopecia. In Primary Cicatricial Alopecia, hair loss is a result of the damage caused to hair follicles due to a destructive inflammatory process. The underlying reasons are still not known. In Secondary Cicatricial Alopecia the destruction of hair follicles is due to an external injury, such as severe infections, trauma or burns. Cicatricial Alopecia is not like any other typical hair loss condition where the destruction is limited to the death of the hair follicles; it also causes blisters with fluids, redness or scaling in the affected areas of the scalp. Cicatricial Alopecia leads to permanent hair loss and is considered one of the most difficult hair loss types that is hard to cure as well as prevent. Telogen effluvium is considered the second most common form of hair loss experienced by women. It generally occurs after women give birth or at the time of their menopause. This hair loss type that affects both men and women, is a condition that is associated with aging. It is a natural process where the hair starts thinning as we get older, resulting in gradual hair loss. As we grow older, the amount and density of our hair follicles decreases. As the growth cycles of hair follicles begin to the shorten, our hair becomes unable to receive adequate nutrional intake, causing our hair strands to weaken and eventually to fall out in a short period. Growing older is a natural process of our life cycle and in most cases this type of hair loss is an inevitable part of aging. Although it is not possible to prevent the occurrence of this type of hair loss, we can still delay this process by taking good care of our hair. Generally experienced by men; Alopecia Barbae is a type of Alopecia Areata that occurs in the beard section causing hair loss in patches that are round. Progressing either at a slow pace or occuring suddenly, the causes of Alopecia Barbae still remain uncertain, however it is thought to be due to genetic predisposition or autoimmune diseases. It is also assumed that hair loss may be triggered and accelerated by factors such as depression or stress via affecting the immune system. Anagen Effluvium is hair loss condition that is generally experienced by people who fight diseases and are on heavy medication or treatment. This is a hair loss type that can happen to anyone of any age. As the shedding process occurs during the anagen phase, hair strands fall out without thinning. This hair loss condition is a type Alopecia Areata that affects 0.0001 % of the people at any age. However, the loss of hair is not localized or in the form of patches; it causes complete hair loss throughout the body. Alopecia Universalis similar to many Alopecias, is believed to be an autoimmune disorder, in which a person’s immune system attacks the hair follicles as a defense mechanism, thus leading to loss of hair. Now you are familiar with the 10 major forms of hair loss experienced around the world. Naturally, there can be other different causes that lead to hair loss. To obtain information about the treatments for these hair loss types and to receive support, you can contact Dr. Serkan Aygin. Who is Dr. Serkan Aygin? Since 1996, he has only been performing hair transplant procedures and offering hair treatments. He is one practitioners operating in this field. He has a doctoral degree in both Dermatology and Pharmacology. He is specialized in the application of specific medical treatments for the scalp and hair. Currently he is performing hair transplant procedures. After performing hair transplant procedures with the FUT method in the 90’s, he started utilizing the FUE technique since 2004; a hair transplant technique that leaves very little scarring. In 2017 he started applying the DHI (choi implanter) method, which is the advanced version of the FUE technique that leaves hardly any scars. He has attended more than 40 seminars and conferences in many countries around the world. He is a member of the International Society of Dermatology. We wish you and your loved ones a a healthy life.